I recently upgraded to 6.0.1 Marshmallow on my Galaxy S5 and I would like to adopt an SD card as internal storage. However, there is no option to do this. 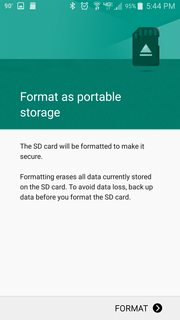 When I format the SD card, there is no "Internal" option, only a "Portable" option. I have tried formatting the SD card in windows, deleting the partition in windows, and even wiping the parition in windows. But Android always wants to add it was portable storage. 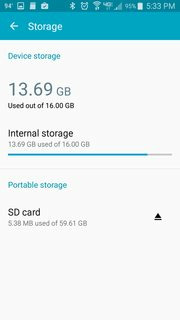 How can I force Android to add this as internal storage? EDIT: According to this article, the Galaxy S7 doesn't support adoptable storage. So it's likely the S5 doesn't support adoptable storage either. I'm looking for a way to enable it using the adb command line if possible now. 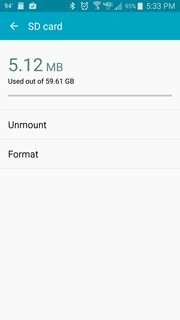 Samsung (and some other manufacturers') devices don't support Adoptable Storage by default. However, there are some workarounds how you can enable it. Some devices will require root, and others don't. If you have a Galaxy A5, J5, J7, On5, choose method 2 (root required). Before proceeding, make sure you have a backup as this will format your SD card. Replace <DISK> with the output of the previous command. (example: sm partition disk:179,64 private). If you don't want to convert the whole disk, then use this command instead: sm partition <DISK> mixed <VALUE>. Replace <VALUE> with the percentage (0-100) to keep as external storage. (Example: sm partition disk:179,64 mixed 50, for 50%). If you do have root access, you can use my app Root Essentials instead. Root Essentials will execute all the commands for you, without the need of a PC. If the above method didn't work for you, then it is not possible to get adoptable storage without root. (e.g. Galaxy A5, J5, J7, On5). If you have rooted your device, you will need to download my app Root Essentials. After you have downloaded it, go to "Adoptable Storage". Then click the button "Adopt". Root Essentials will ask you to flash a plugin using a custom recovery. (e.g TWRP). It is not possible to flash the plugin without a custom recovery. After you have flashed the plugin, reboot your device and open Root Essentials again. Now try adopting your SD card again and it should work. 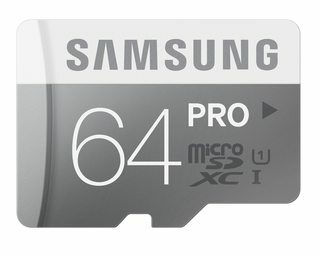 I have adopted my SD card successfully, what do I need to do next? After you have adopted your SD card, you will need to migrate your existing data to the SD card. This is to free up space on the internal storage. Tap "Storage". (or "Device maintenance" > "Storage"). Open the menu (3 dots at top right), and tap "Migrate data". Now your data will be migrated to the SD card. Apparently need to add the "sm" so: "sm partition disk:179,64 private" otherwise "Partition not found." I'm very new at this, so I'm probably stating the very, very obvious for most people. Anyway, seems to have worked. This was on a Note 4. I assume what's happened at this point is that, though the total size isn't listing as changed, it actually is. Wish I knew how to confirm with these tools. Slight correction: Under "Storage" it does list the total correctly with internal being mostly full (as it was) and almost nothing on the card. Assume I can just treat it all as one big happy pile of storage at this point? But what was meant by "can't be used for transfers"? I assume you're just meaning that you can't yank the thing out and pull things off and on with a computer or other device? Anyone care to share some caveats or tips after getting to this point? Not the answer you're looking for? Browse other questions tagged 6.0-marshmallow samsung external-sd adoptable-storage or ask your own question.